Urban warfare training at Mitkan Adam. Photo courtesy of Erik Schechter. Keeping a cautious eye on his flanks, a baby-faced Israel Defense Forces (I.D.F.) infantryman negotiates his way down a rocky slope to a pair of drab, concrete structures. 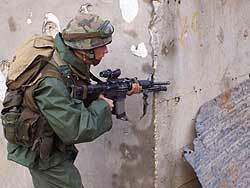 He reaches the outer wall of the first building and, preparing for a Palestinian ambush, pushes his Colt M4A1 marksman rifle around the right-hand corner. Only afterwards does he ease into the turn. But no gunman is lying in wait on the other side. The soldier reels back, and signals the all clear to his section member, who is waiting behind an outcropping. The young private then vets another corner as his friend scrambles downhill; together, the pair inch toward the door — the man in the rear training his gun upward at potential snipers. A grenade toss later, the two are inside, goggles on, raking a living room with semi-automatic fire. The bullets are real enough, but the “grenade” is just a rock. As for the one-story home, it is as bare and gray on the inside as it is on the outside. That’s because it is part of a mock Palestinian village located on the Mitkan Adam military base, north of the Israeli town of Modi’in. Here, I.D.F. — and in the past, American — infantry units brush up on their close quarters combat skills. For two years now, I.D.F. units trained in urban warfare have operated with moderate success in West Bank cities, killing or capturing thousands of terrorists and thwarting their objectives. However, the Americans in Iraq — though skilled in these same tactics — are far from home, facing a tougher opponent, a more porous border, and the challenge of nation building. The results so far have been mixed. In late September 2000, then opposition leader Ariel Sharon made his fateful decision to ascend the Temple Mount in the old city of Jerusalem. The visit was intended to demonstrate Israeli sovereignty over Judaism’s holiest site — which is also venerated by Muslims, right after the cities of Mecca and Medina. The Palestinians, already frustrated by the failed peace summit in July, reacted with fury to the controversial visit and the Aqsa Intifada was born. But the events of March 2002 — “Bloody March,” which saw 22 suicide bombings and 133 deaths — forced the army to re-think its approach. In April, as part of Operation Defensive Shield, the I.D.F. surrounded West Bank cities with checkpoints, an arrangement called a keter (“crown”), and sent in infantry backed up by tanks and armored bulldozers. In Nablus’s Balata refugee camp, paratroopers came up with the idea, quickly adopted elsewhere, of avoiding snipers and booby-trapped doors by moving through holes made in the walls of homes. The tactic was a lifesaver. A reservist battalion not trained in urban warfare had lost 13 soldiers — over half of all Israeli casualties in the operation — in just one alleyway ambush in Jenin. An Islamic Jihad militant, interviewed by CNN in April 2002, said that Jenin’s refugee camp was laced with “1,000 to 2,000” booby traps. But neither bombs nor rocket propelled grenades could match the two-story D9 armored bulldozer, which plowed through Palestinian firing positions, clearing an urban area the Israeli foreign ministry puts at 2.5 acres but others say is 6 acres. In addition to armor, Israel has also used its air force during the Intifada. In early October 2000, two I.D.F. reservists took a wrong turn in the road and drove into the West Bank city of Ramallah, where they were lynched at a Palestinian Authority police station. The frenzied murders were caught on film by an Italian TV crew. Seeking revenge, Israel unleashed its helicopter gunships on the Palestinian Authority. The Ramallah police station, a government radio station, a Force-17 paramilitary base, and another police station in the Gaza Strip were all destroyed. Pique became policy three weeks later as gunships started hunting down individual terrorists. Often aided by remotely piloted spy drones, these high-tech extrajudicial killings were justified on the grounds of self-defense: The militants were always said to be slain on their way to an attack. But by July 2002, senior Hamas leaders were added to the hit list, and on March 22, 2004, Israel struck down Sheik Ahmed Yassin, the quadriplegic leader of the Islamist movement. “As the risk of suicide bombings grew, we worked from individual terrorists all the way back to the masterminds,” says Israel Air Force Brig. Gen. (res.) Nehemia Dagan. Though an opponent of targeted killings, Dagan has “no doubt” that they hurt Palestinian groups. Indeed, following the assassination of Yassin and, soon afterwards, that of his successor Dr. Abdel Aziz Rantisi, almost five months passed without a single suicide bombing. By the end of 2004, a little over 990 Israelis — mostly civilians — had been killed in the Intifada, says Don Radlauer, an associate at Herzliya’s International Policy Institute for Counter-Terrorism. By contrast, there have been some 3,500 Palestinian deaths during the same period, according to the Palestine Red Crescent Society (P.R.C.S.). How successful has Israel been at killing militants? Unfortunately, terrorists do not generally wear uniforms, but the P.R.C.S. says that 74 percent of Palestinian casualties are ages 16-40 and almost exclusively male. “I would say that 58 percent of the Palestinians killed are combatants, and that’s being very conservative,” says Radlauer. But body counts tell only part of the story. No one is shooting on the Gilo neighborhood anymore. Suicide bombings have declined from 39 in 2002, to 11 in 2004. Terrorism continues, albeit at a reduced level, and the question is, to what end? And some in the Palestinian leadership admit as much. On Sept. 27, 2004, Jordanian daily al-Ra’i published an interview with Mahmoud Abbas, now chairman of the Palestinian Authority. In the piece, which was translated by the Middle East Media Research Institute, Abbas argues that the insurgency failed to deliver on any concrete goal. Some predicted, says Abbas, “that after the killing of 1,000 Israelis in the Intifada, Israel would collapse, as would Sharon; the second opinion is that the armed Intifada would liberate the homeland; the third opinion is that the Intifada would bring the settlements to a halt” — none of which happened. In late March 2004, four American private contractors were ambushed and killed by insurgents in Fallujah, on the east bank of the Euphrates River. A Sunni Arab mob then dragged the burned bodies through the streets and hanged at least two of the slain Americans from the girders of a bridge — provoking an assault on the city by U.S.-led Coalition forces that ended prematurely in early April with a unilateral truce. From then on, the Americans made do with sporadic air strikes against foreign terrorists in the city. In early November, the Americans got another crack at the insurgent stronghold of Fallujah with the still-in-progress “Operation Phantom Fury.” United States Marines and Iraqi forces, in what’s called a “dynamic cordon,” ringed the city with checkpoints in an attempt to fix the insurgents in place as remotely piloted surveillance drones circled overhead on the lookout for stockpiled car bombs. The Americans led with tanks, which broke through enemy lines and drew out the rebels, who were overmatched in terms of firepower. D9 bulldozers plowed through enemy positions, and infantry bypassed booby traps and snipers by traveling through holes in breached walls. There are a few snipers holding out, but so far, over 1500 insurgents have been killed and a few thousand more captured, according to the Pentagon. The Americans clearly did their homework before going into places like Baghdad, Ramadi and Fallujah. However, while Israel walked away from the Intifada a bruised-up but confident winner, the same cannot be said for Americans in their war in Iraq. Since June 1, 2003, which marked the official end of the war against Saddam Hussein, almost 950 American soldiers have been killed by ex-Baathists, foreign jihadists and Sunni sectarians. These mounting casualties have turned the tide of American public opinion against the war. In July 2003, a Gallup opinion poll found that only 27 percent of Americans thought it was a mistake to send troops to Iraq; by January 2005, the number climbed to 50 percent (as opposed to 48 percent who still support it). The Iraqi election is scheduled for Jan. 30, yet the insurgency, in contradiction to the rosy prediction, is just getting stronger. An estimate in the first half of 2004 put the number of militants at 5,000, but by October, it had climbed to 12,000. Now, the Iraqi Interim Government says there might be as many as 20,000-30,000 insurgents. And indeed, local Coalition allies have been regularly targeted. In the last four months alone, insurgents have killed at least 1,300 Iraqi police officers, according to the Iraqi Interior Ministry. The Iraq Body Count Web site counts 60 “reported suicide and possible suicide bomb attacks” for 2004. So far this year, there have been over a dozen car bombings, suicide or otherwise. Unlike the self-taught terrorists of Jenin, many of the Iraqis served in Saddam’s disbanded army, whose heavy, surplus weapons are easy to come by. “Before the war, Iraq was an ammo dump with a government,” says John Pike, an analyst with Globalsecurity.org, “Now it’s an ammo dump without a government.” In fact, much of the explosives used in car bombs are not cooked up in underground laboratories but are taken straight from Iraqi artillery shells. Another issue is one of neighbors and borders. Jordan and Egypt, Israel’s neighbors to the east and south, have managed to stifle gunrunning and infiltration. (The few foreign terrorists that have entered Israel attacked from Lebanon or came legally, such as British citizens Asif Hanif and Omar Sharif.) Still, in the summer of 2002, Israel began construction on a security fence, which is now slated to be 700 kilometers long, to separate itself from the bulk of the Palestinian population. Unfortunately, Iraq is surrounded by Syria, Saudi Arabia and Iran, which are not interested in seeing a pro-Western Arab democracy. At best, these states have ignored anti-Coalition infiltration across Iraq’s 3,600-kilometer-long border. “And you cannot build a fence around Iraq,” notes Pike. The I.D.F. can always withdraw once the terrorists are killed or captured, and let the Palestinian Authority pick up the pieces. However, the Americans are engaged in the hands-on job of building a new state, so they have to protect themselves and Iraqi society against very determined, mostly local rebels. General Yair cites the traditional view that one fights guerillas by “draining the swamp” — that is, turning the population against them. But with what can it be bought? The Sunni minority of Iraq, which backs the insurgency, enjoyed a privileged position under the former Baathist regime. A free and democratic Iraq, the stated aim of the Coalition, would hardly be in their narrow sectarian interests. Finally, the Israelis, unlike the Americans, dominate their enemies in the intelligence arena. Israeli brigades, such as the Binyamin Brigade in the northern West Bank, are based on a territorial command structure, with individual battalions and undercover units rotating in and out as needed. These brigades are paired up with police and Shin Bet districts, which deliver a steady flow of tactical intelligence garnered from Palestinian prisoners and collaborators, says Colonel Michelsohn. In addition, in the last decade, the I.D.F. has created half a dozen territorial battalions, such as Duchifat and Haruv, each operating in only one Palestinian city. “The units serve as the town sheriff so that we’re able to tell who are the baddies and who are the goodies,” explains General Yair. The Americans have very few Arabic-speaking troops and nothing akin to the Shin Bet in Iraq. But they could have used native personnel. General Vallely believes that it was a mistake to disband the Iraqi army (or what remnant hadn’t already gone home) and not to have immediately installed an interim government after the fall of Saddam. “General Casey is working on border patrol and an Iraqi intelligence network, but we lost a year,” he says. Similarly, Newsweek reported on Jan. 10 that the Coalition is finally training undercover units, composed mostly of Kurds and Shiites, to hunt down Sunni insurgents. Whether such changes, plus an elected government, will have an impact remains to be seen.